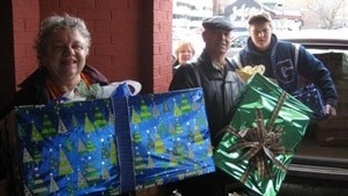 Each year at Christmas time, friends and members of RPC respond to gift requests from residents of Portland Place in downtown Toronto. Portland Place was originally a not-for-profit housing development of Evangel Hall, but has, in recent years, developed its own independent governance structure. It is a marvelous community of 65 people of all ages living in a modern 6-story building in downtown Toronto. The residents are on social assistance, so the members of RPC become involved mainly at Christmas providing each resident with at least one gift. To become involved with our annual gift drive, or to find out more about how you can share your time and experience with residents at Portland Place, please contact the church office at 416.921.1931.